Printmaking is an attractive medium of expression in that: it serves as an indirect communication vehicle; the materials used convey a strong sense of physical reality; and it is a robustly physical form of expression with a variety of print types. The printmaking studio teaches basic printmaking techniques through practical training in the four main print technologies of copperplate, lithography, wood-block printing, and screen-printing. In addition to deepening student understanding of the characteristics of expression for each print type, it deepens creativity and research based on the historical and social backgrounds in which printmaking has evolved while incorporating the plethora of artistic genres that have developed since printmaking first appeared as a simple printing medium. Since 1970, the program has provided two years of basic training for undergraduates as part of a program transferred from the third year of the Oil Painting Course. Currently the curriculum is under review. 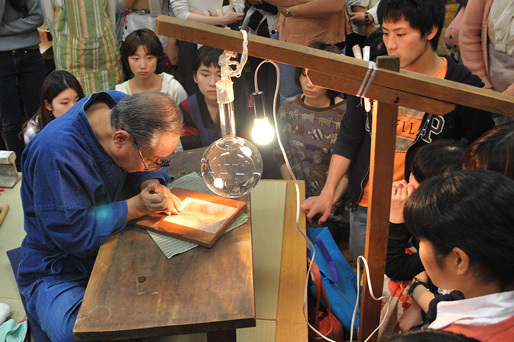 Since 1967, this studio, which serves as a communal workshop within the university, has opened its doors to those enrolled in the Oil Painting, Japanese Painting, and Art and Education courses as well as the Design (through 1975) and Aesthetics and Art History departments, based on intensive lectures on basic methods and techniques. While continuing to serve as one component of an overall education in the painting arts in accordance with each of these curricula, the program also pursues training and research specific to print expression, seeking to develop in individuals the skills and capabilities needed to contribute to society at large and to develop artists capable of thriving not just in Japan but internationally, based on foundations incorporating the basic methods and techniques of each print type and research into printmaking materials. 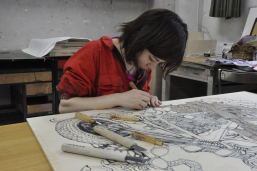 Graduate education in the printmaking studio is based on a number of intensive lectures which are open to those enrolled in other departments and courses, including Japanese Painting and Aesthetics and Art History. For students of each print type – copperplate, lithography, wood-block printing, and screen-printing – the curriculum focuses on creative research. Students can join basic practical training and materials research programs targeted at third- and fourth-year undergraduates, incorporating these activities into their work at their own discretion. Space for displaying student work, known as the print gallery, is available in front of the studio, serving as a space where students can present current work on their own. Work is also presented outside the confines of the university through group exhibitions, competitions, and individual exhibitions. Instructors also exhibit work, both individually and as a faculty, in galleries, museums, and other venues. 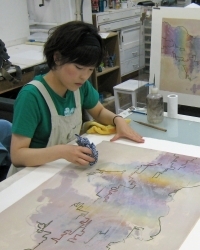 Japanese printmaking is regarded highly on the international stage, and numerous international students seek to study in the program. Numerous students have been accepted from Asian nations such as South Korea, China, Thailand, India, and Pakistan, as well as Western nations including France, Germany, Austria, the United States, Canada, and Australia. This program contributes significantly to international goodwill and cultural exchange. In the doctoral program, comprehensive, integrated group guidance is provided at more advanced levels by primary and support instructors, on both creative work and theory, to support students in completing doctoral degrees. Guidance also focuses on providing students with the skills needed to present their own creative and research activities within society and to mature into specialists capable of pursuing careers in art on the international stage.